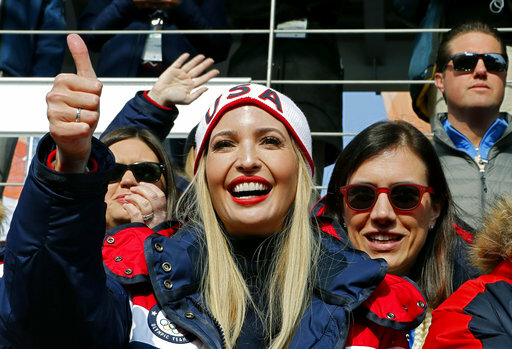 Ivanka Trump wore a U.S. women's bobsled silver medal on Sunday, and the First Daughter sure looked like the new First Fan of bobsledding. And the U.S. sliders seemed to enjoy having her around. The daughter of President Donald Trump spent part of the final day of the Olympics watching the four-man competition at the Alpensia Sliding Center, befriending, among others, Cora Weber _ the 4-year-old daughter of U.S. bobsledder and U.S. Army green beret Nate Weber. "I'm running up there after this," U.S. pilot Nick Cunningham said when he was asked if he met the president's daughter yet. "It's nice to have the support of everyone. It's such a great experience to come down and see her in the stands, see Dale Earnhardt Jr. in the stands. We're not really a big sport, except for two weeks every four years. We like that they're here, giving us support." Ivanka Trump also spent time Sunday with U.S. luge Olympians Taylor Morris and Matt Mortensen. Morris and Mortensen are both members of the U.S. Army, and she thanked them for their service.